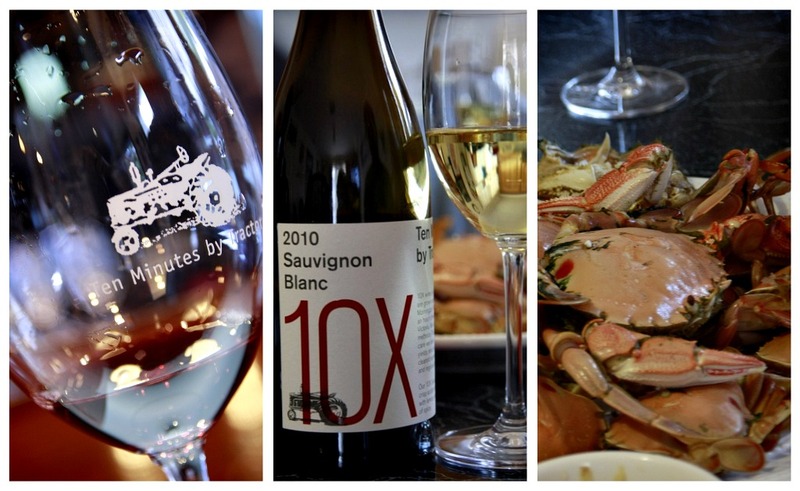 So, after little to no convincing, we pack up our crabs and hopped in the CRV in search for some delicious vino. We hit 10 MbT first. I always wanted to go to this place both for the food and wine and it’s had some really good reviews, recently just missing out on its second hat in the good food and wine guide. Their name comes from the fact that the original 3 vineyards used to make their wines was only…yup, you guessed it…600 seconds my tractor. Or 10 minutes. Whatever. The 10X range is an obvious play on this and its their standard wine that they will have every year, with reserves coming out on better vintages. On to the wine! This was the first wine we had on the day The nose is of tart green apples, grass, straw and semi ripe peaches. Reminds you of a lush, thick countryside. The wine also gives off the impression that it’s going to have some weight on your mouth. The initial attack is a knitted mix of acidity and gravelly tannins which stays with your throughout the mid palate. The flavours are kind of like a granny smith apple; slightly tart, slightly sweet and somewhat powdery and chalky. There is also some honeydew melon thrown in there and it does that thing a kiwi fruit does to your tongue but only a little bit. Finishes long and leaves a med to heavy feeling on your mouth. The other thing it did was it made me think straight away of crayfish, prawns and lobsters with a creamy fragrant sauce. My brain and tummy went straight to a burnt butter sauce. I think it’s one of the main reasons we bought this, especially because we were having crab for dinner! The crabs we had were both fried and steamed and paired with a sweet/sour/chilli asian sauce. It wasn’t ideal and didn’t mesh that well with the wine and accented the chilli. It worked better with the fried crab on its own mainly because of the weight of the wine, but not what it could have been. Still enjoyable, but I think I’m going to have to make a batch of burnt butter and crack one of these guys open. All in all, I found the wine very linear and one dimensional, but very layered but extremely concentrated and strong in flavours with the weight to match. I think with a bit of time, it may develop some secondary flavours but I’m not sure how long it will last in the bottle, 12 months maybe? Perhaps it could be decanted? Either way, at $28 bucks, I can get behind this wine, any excuse to go crabbing amiright!? 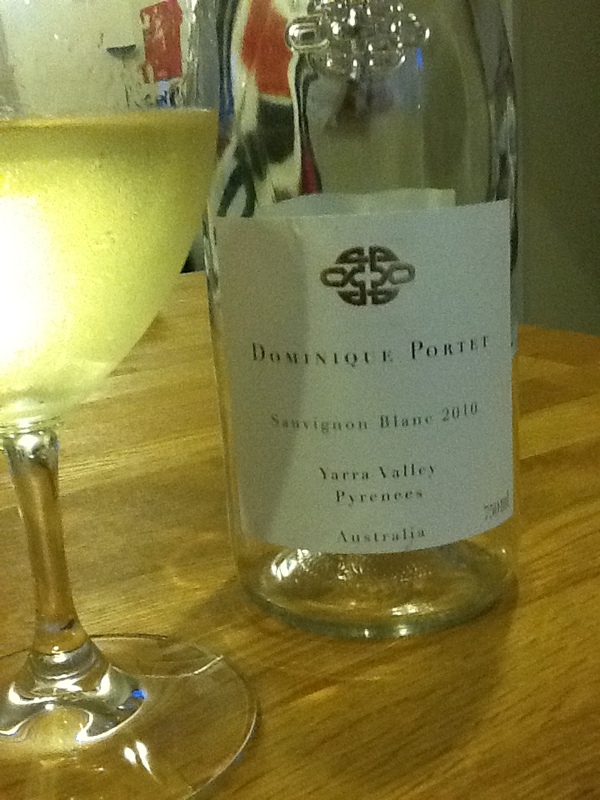 Dominique Portet is a little winery down in Yarra Valley own by father and son Dominique and Ben Portet who are big on old school French style winemaking (and could be french themselves!?). Got this little number when a bunch of good friends and us cashed in our scoopons for a Yarra Valley wine tour. Having zero responsibility to drive, we lapped up the vino like thirsty camels. This sav must have cos we have 2 bottles! I think they were about $20-25 a piece, definately top end sav blanc price range, 13.5% acol which is surprising. I remember they also have a rose and champagne which made an impression on me. Did it deliver? Sweet sour apples, a mix of granny smith and golden delicious with a fist full of passionfruit. Very appetising, extremely light and zesty. It has a tingly, almost fizzy feeling on your mouth and it almost floats on your tongue. Solid mouth feel though and has an intersting mix of salty sour fruityness which lots of apples, passionfruit, apple skins; kinda like the feeling when you bite too deep into a Nashi pear but have enough of the sweet bits. Heaps of a mineral aspect to the wine which mingles with the saltyness, imagine bath salts? kinda? The tingling feeling extends all the way to the finish and the sourness drifts off but the sweetness and saltyness lingers. Interesting wine…what we found is it didn’t hold too well as it warmed up nor was it better (prob worse) day 2 so definately drink the whole bottle first time and on ice. Also, the tingling fizzyness subsided as the hours past. We also found it a bit difficult to pair it with food. We tried pork day 1 and prawns day 2. Definately worked better with pork, the wine has a weight to it even though the mouthfeel is light and the flavours come across very strong and accented. I’m thinking a feta and wallnut salad may match better, definatly on a nice sunny day.